Broadway Youth Cebu believes in the talent of the young Cebuanos, as many of them are innately gifted in musical theatre. Unfortunately, very few opportunities have been made available for them to showcase these talents. Moreover, many of these talented young people are unable to afford high-quality theatre training from international artists. But Broadway Youth Cebu also believes that musical theatre should be inclusive and not just for those who can afford it. While this workshop was conceived to provide students with top-quality theatre training from noted local, national and international theatre artists who practice theatre as their main source of income, it was also envisioned to be accessible to all. But this can only happen if funding sources are made available to help pay for these worthy young candidates. Thus, we are appealing to you - our friends - who believe in the transformative power of theatre among the youth, to help us fund a small group of young people to be part of this project. The main goal of this fundraising campaign is to raise at least $4,000 to cover the tuition of our 12 performance track and 5 production track scholars. These performers, who have shown strong passion and dedication for the performing arts but lack the financial resources to be part of this project, are appealing for your generous support. The Broadway Youth Cebu Summer Musical Theatre Workshop is a tuition-based program. Tuition assessed goes to help pay for the costs of licensing the musical, rental of the rehearsal venue, and workshop materials. The cost of the workshop is comparable to most two to four-week summer theatre workshops offered in Manila yet this workshop runs for 13 weeks in total. Performance Track tuition costs PHP12,000 ($250) while Production Track costs PHP10,000 ($200). 12 Performance Track and 5 Production Track scholars are being fundraised for. With the minimum wage in Cebu set at PHP366 or $7.10, the workshop fee of PHP12,000 is out-of-reach for many Cebuanos. Yet despite the financial difficulties, many of these young people are brimming with talent. The 12 young men (for performance track) and 5 women (for production track) identified to be part of the scholarship program all deserve to be awarded support for the show. We have candidates who attend schools whose annual tuition fees are way less than our workshop fees. A significant number of candidates come from the Badian National High School, a small beach town about 100 kilometers from the city. Yet another candidate comes from the state-run school premiere school for the arts, the Philippine High School For the Arts. By giving, you are offering a chance for these young passionate Cebuano performers to be a part of this historic production. Your donation will give them an opportunity to get training from noted theatre artists from around the world and to perform in a fully licensed musical production that will be enjoyed by the Cebuano audience. It is not often that Cebuanos get to enjoy top caliber musical theatre productions such as this, so this may also help promote the development of musical theatre in Cebu. If you believe that musical theatre has the power to transform the lives of our young people for the better, then I appeal to you to please give to this cause. Your gift makes it possible for these young thespians to experience theatre in a professional setting and get to work with international artists. 100% of the money raised in this campaign will go to the production. If the campaign raises more than the goal, those funds will help cover other expenses incurred by the production. If the goal is not reached, we may only allow some candidates to experience this project. Putting up this show is a huge undertaking, requiring a community to build. We need friends like you to help us make this dream for our young Cebuanos a reality. On behalf of my team, I am again appealing to friends of theatre, especially those who I had the privilege of working with (former students, parents, supporters and colleagues) to help this group of young talented Cebuanos. To my former students in Cebu, on Guam and in Hong Kong, I hope you can "pay it forward" by letting them experience how transformative musical theatre has been for you. Do help spread this campaign around. Even if you live far away from Cebu, your help will greatly impact the growth of theatre there and with this project's success, help inspire more musical theatre projects. 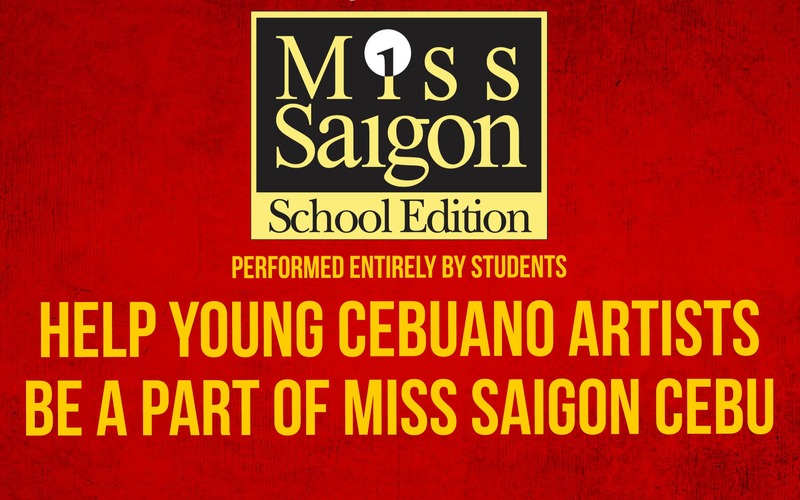 All donors will be acknowledged on the Miss Saigon School Edition Cebu website and souvenir booklets. Here's to helping these young talents!